A wrap is a soft flatbread rolled around a filling. The filling used can be from meat, poultry, fish, lettuce or vegetables. Wraps are easy take away food. It is suitable for lunchboxes. In this recipe I used a different combination of filling. Yes, I used banana blossom and spinach. Banana blossom is good for women. Spinach is rich in antioxidants and calcium. 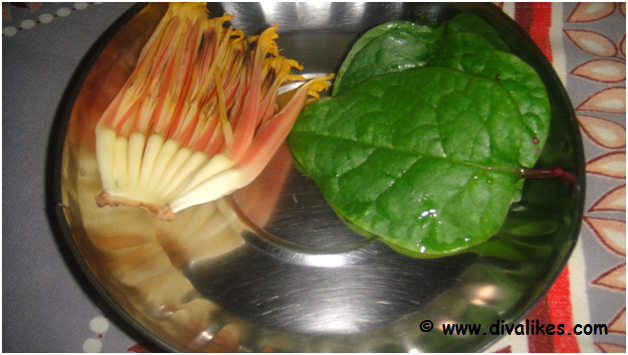 Also banana blossom and spinach are healthy, though many won't like to have it. It will be easy way to indulge these healthy ingredients in diet. The cooking time is very less if we have all the ingredients ready. Heat oil in a pan, add the cumin seeds and let it crackle. 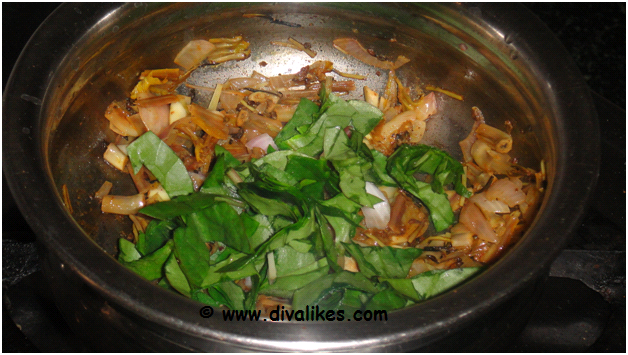 Add the chopped onions and saute till transparent. Add the chopped banana blossom and stir well for two minutes. Now add the spinach and saute till the raw smell leaves. Add the garam masala, salt and sprinkle little water. Cook for five minutes in low flame. Stir in between. 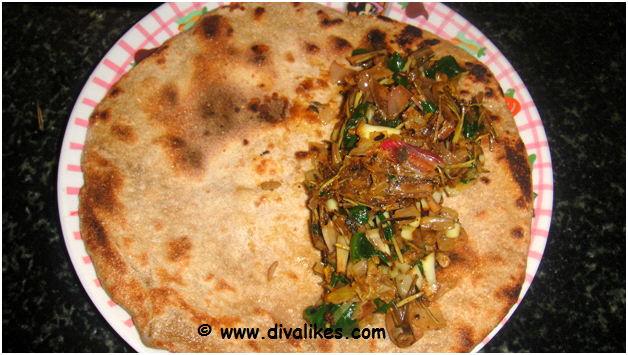 In the mean time, heat the precooked chapathi for two minutes. 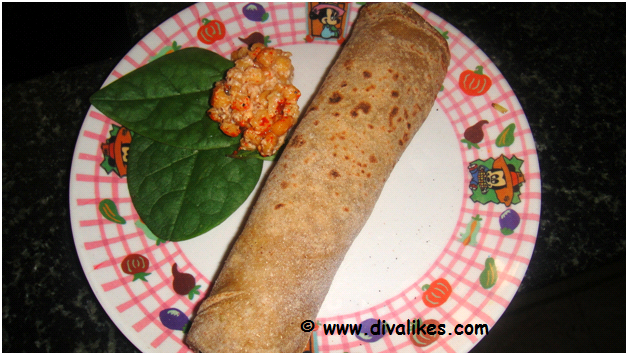 Fill the filling on the heated chapathi and roll. Healthy wrap is ready to serve. 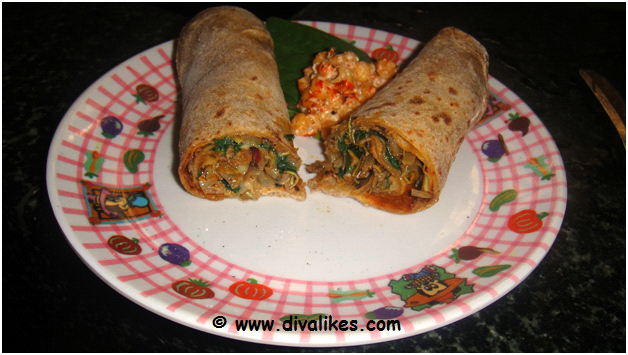 Serve the healthy wrap with boondhi raita. Banana blossom will darken when chopped before. 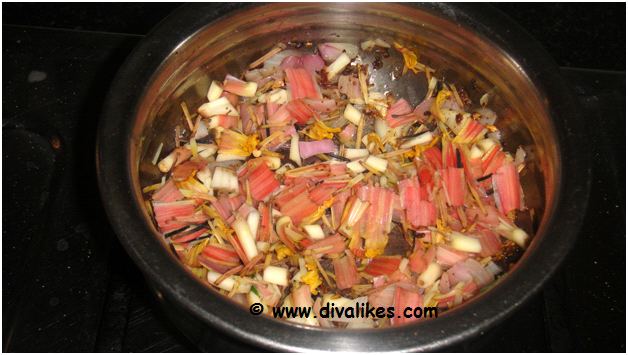 So, chop just before sauting or place the chopped blossoms in salt water.